My thoughts have evolved on diet, pets and cancer. We’ve known for a long time that some cancers may result in potentially significant weight loss. The impact on the dog depends on tumor type, location, and whether it has spread. Cancer patients are known to have significant changes in metabolism of carbohydrate, proteins, and/or fat. Just cancer itself and/or its treatment can also contribute to weight loss, especially if there is nausea and decreased appetite: The dog takes in fewer calories than its body requires, so the dog loses weight. In some patients, there is a syndrome is known as cancer cachexia. These dogs have progressive weight loss, in the face of adequate calories and nutritional intake. In either case, decreased body condition can eventually lead to decline in quality of life and overall survival. 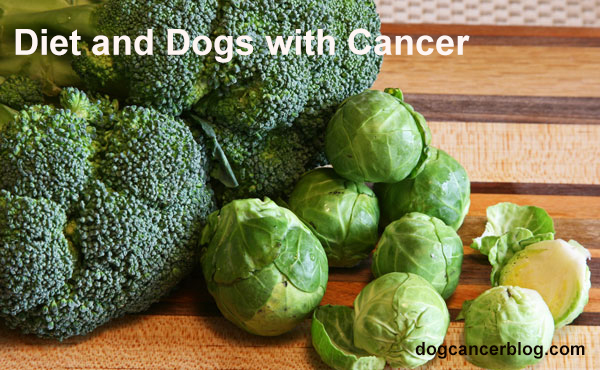 So it is no surprise how important nutrition is in dogs with cancer. The goals of nutritional management in cancer patients are to provide adequate nutrients to aid in recovery, decrease the negative energy balance brought on by cancer cells, and continue to maintain appropriate body mass. This will ultimately aid in improving their quality of life, possibly increasing the effectiveness of cancer treatment and survival times. These nutrition goals are not new. For years I’ve included a Nutrition & Cancer information sheet with the handouts I provide at an initial oncology appointment in my practice. But, after co-authoring the Dog Cancer Survival Guide, and recently attending the AHVMA (American Holistic Veterinary Medical Association) meeting this summer, I decided the handout needed a good update. My thoughts on nutrition have evolved, for cancer patients and all pets. We will get to that soon. In my opinion, it is not fair to blame commercial diets alone for cancer. Cancer is not caused by one thing. Causes include genetics, environmental factors, and toxins. It’s a complicated, multi-step process to turn a normal cell into a malignant cancerous one. But there are some potentially damaging by-products in dog food. Processing and high heat can alter the food value. Other issues include antibiotic residues, mycotoxins, storage mites. Some ingredients in some diets come from poor quality food supplies with depleted resources. Some chemical preservatives put in foods may have toxicity, such as ethoxyquin, BHA, BHT. Many dog foods have excessive carbohydrates (see below) including corn, soy, beet pulp which may include genetically-modified organisms (GMO) foods. Genetically-modified crops are exposed to increased levels of pesticides. Sounds pretty bad, right? All these things are not found in every bag or can of dog food, but it is worth looking into the ingredients and where they come from. And there is an important advantage of commercial diets prepared by a reputable manufacturer: These diets are tested in feeding trials and pass AAFCO standards, so you know they meet the nutritional requirements for adult dogs. Should I prepare my dog’s food? Some people choose to prepare a homemade diet. The goal is wholesome unprocessed foods. The benefits/claims include: increased vigor, improved hair coat, decreased allergies, less inflammation, less stool and odor, and weight control. But you cannot just cook meat for your dog and call it a day. These diets need to be balanced to account for important vitamins and mineral requirements, so your dog doesn’t develop significant deficiencies. I suggest a reputable source for the recipe. 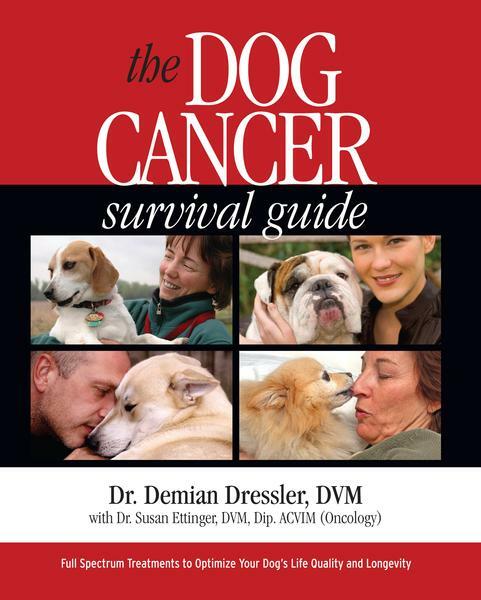 Dr. Dressler has a cancer diet in the The Dog Cancer Survival Guide, and many of my clients use it and are very pleased. If you are interested in cooking, you can try this one. Pay close attention to the vitamin supplementation recommendations. Also consider consulting with a veterinary nutritionist to assist in creating a balanced food for your dog – especially important if your dog has other medical issues. Check out ACVN.com to find a nutritionist. Another helpful site to help you is Petdiets.com. In my opinion, a homemade diet can be a lot of work. As a working mom, getting a homemade diet to the kitchen table for my family on a daily basis is a challenge in itself. I do not home cook for my pets, and I’ll provide alternatives later in this post. To learn more about Diet for Dog’s with Cancer, get a copy of this informative seminar! What’s the deal with cancer diets? No carbs, right? Since cancer cells use glucose (carbs) as an energy source, there is a lot of worry with feeding carbs to cancer patients. The idea behind a cancer diet is low carb, and high in quality proteins and fats. While there is little scientific data specifically showing feeding such a diet helps treat the dog cancer, as long as the diet is balanced, I think there is no harm, in my opinion. Remember: carbs are not all inherently bad, and some sources contain many valuable vitamins and minerals. Instead of generalizing “all carbs are bad,” I think we should be more critical of the carbs source such as GMO (see above). For me, the grain-free diets are less important than the source of the grains. But I don’t think you need to eliminate all carbs. Although fruits and veggies are carbs, they also provide naturally occurring phytochemicals, flavonoids, and vitamins. Such dietary agents are called chemopreventative because they have potentially cancer-fighting properties that promote cell death (apoptosis) in cancer cells – they help get rid of deranged cancer cells. Epidemiologic studies in people show protective effects of diets rich in fruits and vegetables, and diets low in fruits and veggies have been associated with cancer risk. When one of my patients gets diarrhea – whether due to the cancer, chemo, or medications (like antibiotics), I recommend boiled chicken and rice. A few days of rice is unlikely to make a significant impact on the cancer, but will definitely impact the diarrhea – in a good way. Everything in moderation, as I tell my kids. I barely have time to cook for myself/my human family. What else can I do? There is good news here, because newer commercial options are often minimally processed. For example, dehydrated foods use low heat for the drying process and avoid high heat issues. Usually you just add water (perfect for me!). There are complete dehydrated options that include meat, and there are options where you can add your own meat to the mix of veggies. (Both kinds have the needed vitamins, minerals, amino acids, phytonutrients and antioxidants). One brand to try: The Honest Kitchen. It’s complete and balanced – just add water, made in USA, 100% non-GMO fruits and veggies, 100% organic seeds and grains, and no artificial additives or preservatives. Note from the Dog Cancer Vet Team: This is the most universally-loved dog food here at Dog Cancer Vet. Dogs seem to love the taste, and we love the ingredients. Here’s a link to the “quality dog foods” section of our Amazon store at Dog Cancer Shop. Be sure to check out the many other flavor combinations! I don’t want to completely change the current diet. Anything else I can do? Of utmost importance when changing diets is to do it gradually (typically over 7 to 14 days) in order to avoid complications like loose stools or refusal of the new diet. The most common source of tummy upset is a sudden change of some kind. If you mix the new food in gradually to your regular food, and increase it over time, your dog will get a chance to get used to the taste and the way it impacts his or her gut. So take it slow! And finally, it is important to remember that every patient is an individual. One diet may be appropriate for one patient, but not another – especially if the pet is dealing with multiple diseases. Your own veterinarian is the best person to help you create a diet that suits your dog’s individual needs. Thanks for writing, and we’re so sorry you’re going through such a rough time. Just breathe. Don’t forgot to take care of yourself while you care for your girl. Thank you.. my dog Daisy Mae a German Shepherd mix was just diagnosed with TCC bladder tumor. I liked your article because I don’t have to cook everything however are there any items I can make a smoothie with so she can lap it up? My 12 year old lab was diagnosed with liver and spleen cancer about 6 months ago. She has had on & off loose stools . I have been making her food and can’t seem to find any information about what carbs are safe to add, that might help firm up her stools. Rice does the trick but I’m afraid that is a bad carb. I already add carrot. Any suggestions? He also writes that, yes, most grains, like corn or wheat, are not good for your dog with cancer because they provide too much sugar. However, brown rice and oatmeal are both healthy and filling, and there are a number of benefits of adding small amounts to your dog’s diet. The polysaccharides found in bran in these grains may help to fight cancer. They are also lower on the glycemic index, which means they release lower levels of the simple sugars that cancer loves. my 9 year old golden retriever Daisy has been diagnosed with aggressive oral cancer and she is still eating well. She weighs 70 pounds and I want to know how much meat does she need in the cancer diet per day? Hi Karen, Thanks for writing! There is no one-size-fits-all answer on how much to feed your dog, as there are so many factors to take into consideration. Your veterinarian will be able to help you tailor your pups diet to her unique situation. In your diet guide you suggest pureeing raw veggies. Could theses additions to diet be juiced instead? Both the separated fiber and juice could be mix back into the food or just the juice for faster absorption of the micro/macro-nutrients. Your thoughts? Given that this is a blog for dogs with cancer or for those who want to lessen the opportunity for cancer in their pets, I am confused as to why the suggestion to use carrots in the diet has been made. The free except (pdf) on diet and food prep makes the claim that the glucose found in carrots can feed cancer cells. Please advise. My 12 yo maltese has been diagnosed with hemangiosarcoma and we are completely devastated. He had his spleen removed; no mets. He’s currently undergoing chemo. I’ve bought your book and have been doing all that I can to help him. I’m a little confused about his diet. I don’t have the time to cook, but noticed that you like the Halo canned food. He eats Natural Balance now, so I’m trying to wean him over. Do you prefer Spots Choice (grain free) over Spots Stew (with grains)? I’ve also been giving him Im-Yunity. The Apocaps I read are too large to successfully give to small breeds, so I haven’t tried them. Dr Dressler’s recipe has been working well for my 3-year-old Golden with osteosarcoma (3 weeks post-amp, one chemo treatment so far–both taken like a champ). Max previously ate raw, prey model. He’s always been an ideal weight, fit, and trim. I tried a The Honest Kitchen but he hated it. He ADORES the cooked formula we are using from the book, but I’m more generous with the fats (he is so active, even now) and I simmer the veggies in the meat/liver braising liquid. I have the time and desire to home cook. It warms my heart to cook for him and watch him delight in the food, and honestly, cooking up a batch every three days isn’t so difficult. I am so grateful for such a straightforward formula that actually has room for a great deal of variety. I, too, find it a joy to cook for my pup. Molly is my little buddy of 8 years and I could do no less during this difficult time. She is so excited at meal time and that blesses us both. You have not even mentioned raw diets???? There are commercially prepared raw diets for those who don’t feel they have time to prepare their pet’s food. (My vet even sells these, although I prepare my own.) I have a breed very prone to cancer and feel that raw diet has been very beneficial over the years, including after diagnosis with cancer. Hi Caro, You’re right, the raw diets weren’t mentioned but there’s a reason. Dr. Dressler discusses raw food thoroughly in “The Dog Cancer Survival Guide” and there is a shorter except at http://www.dogcancerdiet.com. He fully supports good quality raw diets for healthy dogs, but does not recommend them for dogs with an immuno-suppressed condition such as cancer. The differences between a human-prepared raw diet compared to wild-caught raw diet, and the potential addition of microbes with handling are worth a thorough read. I urge anyone using or considering a raw diet for their dogs to consider all the information and make their own informed decisions. What I really love though, is that more and more of us are taking real responsibility for our dog’s nutritious meals!